Principal E C Edmonds, Danville Military Academy, Danville, Pittsylvania County, Virginia, was appointed lieutenant colonel, Provisional Army of Virginia, at Camp of Instruction or Hill, on the south bank of the Dan River, one mile west of Danville, Pittsylvania County, Virginia, on 25 May, 1861, and colonel, 38th Virginia Infantry, on 12 June, 1861. P Whittle was appointed lieutenant colonel, 38th Virginia Infantry, on 12 June, 1861. 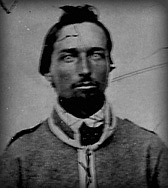 I H Carrington was appointed major, 38th Virginia Infantry, on 12 June, 1861. The company was accepted in state service at Kentuck, Pittsylvania County, Virginia, on 20 August, 1860, and was mustered in state service for one year on 30 May, 1861. The company was accepted in state service at Callands, Pittsylvania County, Virginia, on 23 May, 1861, and was mustered in state service for one year at Danville, Pittsylvania County, on 4 June, 1861. The company was accepted in state at Laurel Grove, Pittsylvania County, Virginia, on 30 May, 1861, and was mustered in state service for one year at Richmond, Henrico County, Virginia, on 3 June, 1861. The company was organised at Whitemill, Pittsylvania County, Virginia, on 27 April, 1861, and was accepted in state service on 24 May, 1861. The company was mustered in state service for one year at Richmond, Henrico County, Virginia, on 11 June, 1861. The company was accepted in state service at Danville, Pittsylvania County, Virginia, 28 May, 1861, and was mustered in state service for one year on 8 June, 1861. Company F Davis Rifle Guard: CAPT. J CARTER, JR. The company was accepted in state service at Republican Grove, Halifax County, Virginia, on 7 May, 1861, and was mustered in state service for one year on 4 June, 1861. Company G Mecklenburg Rifles: CAPT. W TOWNES, JR. The company was accepted in state at Boydton, Mecklenburg County, Virginia, 18 May, 1861, and was mustered in state service for one year on 3 June, 1861. The company was accepted in state service at Pittsylvania Courthouse, Pittsylvania County, Virginia, 7 June, 1861, and was mustered in state service for one year at Richmond, Henrico County, Virginia, on 2 July, 1861. The company was accepted in state service at Clarksville, Mecklenburg County, Virginia, on (?) June, 1861, and was mustered in state service for one year at Richmond, Henrico County, Virginia, on 20 June, 1861. The company was assigned to the 14th Virginia Infantry, Company G (2nd), by Special Orders No.148, Adjutant & Inspector General's Office, Richmond, Henrico County, Virginia, on 27 June, 1862. The company was accepted or mustered in state service for one year at Norfolk County, Virginia, on 26 June, 1861, and was mustered in Confederate service for one year on 6 July, 1861. The company was assigned to the 20th Virginia Battalion Heavy Artillery, Company B, under the command of Lieutenant Colonel A S Cunningham, on 21 June, 1862, and the men and horses of Kyle's Heavy Artillery were assigned to the company the same day. The company was assigned to the 38th Virginia Infantry, Company I (2nd), by Special Orders No.96, Adjutant & Inspector General's Office, Richmond, Henrico County, Virginia, on 3 May, 1864, dated 25 April, 1864. The company was accepted in state at Cascade, Pittsylvania County, Virginia, 24 April, 1861, and was mustered in state service for one year on 3 June, 1861. "A volunteer company recently organized in Danville, has been named the Cabell Guards, as a testimonial of respect for Gen. B. W. S. Cabell, of Pittsylvania co., Va."
The 38th Virginia Infantry was organised at Richmond, Henrico County, Virginia, on 12 June, 1861, and was stationed at Camp of Instruction or Lee, Hermitage Agricultural Fairgrounds, between the Richmond, Fredericksburg & Potomac Railroad and Deep Run Turnpike, two miles northwest of the Capitol, Captiol Hill, Richmond, Henrico County, Virginia, on 7 July, 1861. Mustered for one year, 30 May; 3, 4, 8, 11, & 20 June; & 2 July, 1861: The 38th Virginia Infantry, Company A, was mustered in state service for one year on 30 May, 1861; Companies C, G, and K for one year on 3 June, 1861; Companies B and F for one year on 4 June, 1861; Company E for one year on 8 June, 1861; Company D for one year on 11 June, 1861; Company I (1st) for one year on 20 June, 1861; and Company H for one year on 2 July, 1861. Note: The 38th Virginia Infantry, Company A, was stationed at Camp of Instruction or Lee, Hermitage Agricultural Fairgrounds, between the Richmond, Fredericksburg & Potomac Railroad and Deep Run Turnpike, two miles northwest of the Capitol, Captiol Hill, Richmond, Henrico County, Virginia, between 2 and 9 July, 1861; Company B (70) between 21 and 22 June, 1861; Company C (92) between 13 and 20 June, 1861; Company D (72) on 11 June, 1861; Company E (61) between 21 and 22 June, 1861; Company G (76) between 26 and 27 June, 1861; Company I (1st) (78) on 26 June, 1861; and Company K (97) on 11 June, 1861. General Orders No.25, Headquarters, Virginia Forces, Richmond, Henrico County, Virginia, 8 June, 1861: The 38th Virginia Infantry was assigned to the Confederate States by General Orders No.25, Headquarters, Virginia Forces, Richmond, Henrico County, Virginia, on 8 June, 1861, and was accepted in Confederate service on 1 July, 1861. Note: Colonel E C Edmonds, Lieutenant Colonel P B Whittle, and Major I H Carrington, Provisional Army of Virginia, were assigned to the 38th Virginia Infantry at Camp of Instruction or Lee, Hermitage Agricultural Fairgrounds, between the Richmond, Fredericksburg & Potomac Railroad and Deep Run Turnpike, two miles northwest of the Capitol, Captiol Hill, Richmond, Henrico County, Virginia, by Special Orders No.190, Paragraph I, Headquarters, Virginia Forces, Richmond, Henrico County, Virginia, on 14 June, 1861. Camp of Instruction or Lee, Hermitage Agricultural Fairgrounds, between the Richmond, Fredericksburg & Potomac Railroad & Deep Run Turnpike, two miles northwest of the Capitol, Captiol Hill, Richmond, Henrico County, to Winchester, Frederick County, Virginia, 9-11 July, 1861: The 38th Virginia Infantry was ordered to proceed by the Virginia Central Railroad to Winchester, Frederick County, Virginia, by Special Orders No.214, Paragraph II, Headquarters, Virginia Forces, Richmond, Henrico County, Virginia, at 11.30 AM on 9 July, 1861, dated 7 July, 1861, and arrived by Orange & Alexandria Railroad at Manassas Junction, Prince William County, Virginia, at 2 AM on 10 July, 1861. The regiment arrived by the Manassas Gap Railroad at Strasburg, Shenandoah County, Virginia, at 2 PM the same day and was ordered to proceed by the Valley Turnpike to Winchester, Frederick County, Virginia, in the morning on 11 July, 1861. The 38th Virginia Infantry arrived at Red Bud Run, on the Martinsburg Turnpike, one and a half miles north of Winchester, Frederick County, Virginia, in the evening the same day. Note: The 38th Virginia Infantry was assigned to the Fifth Brigade, Army of the Shenandoah, under the command of Brigadier General E K Smith, Confederate States Army, at Red Bud Run, on the Martinsburg Turnpike, one and a half miles north of Winchester, Frederick County, Virginia, on 15 July, 1861. The 38th Virginia Infantry was ordered to Manassas Junction, Prince William County, Virginia, by Special Orders No.1, Headquarters, Army of the Shenandoah, Winchester, Frederick County, Virginia, at 1 AM on 18 July, 1861. Red Bud Run, on the Martinsburg Turnpike, one & a half miles north of Winchester, Frederick County, to Piedmont Station, Fauquier County, Virginia, 18-19 July, 1861: The 38th Virginia Infantry was ordered to proceed by the Millwood Turnpike to Piedmont Station, Fauquier County, Virginia, at 3 PM on 18 July, 1861, and arrived at Berry's Ferry, on the Shenandoah River, via Millwood, Clarke County, Virginia, at 12 AM on 19 July, 1861. The regiment was ordered across the Shenandoah River at Berry's Ferry, three and a half miles southeast of Millwood, Clarke County, Virginia, at 6 AM the same day and arrived at Piedmont Station via Ashby's Gap and Paris, Fauquier County, Virginia, at 1 PM on 19 July, 1861. Note: Brigadier General E K Smith, Confederate States Army, assumed command of the Fourth Brigade, Army of the Shenandoah, at Piedmont Station, Fauquier County, Virginia, in the morning on 21 July, 1861, and was ordered to proceed by the Manassas Gap Railroad to Manassas Junction, Prince William County, Virginia, at 5 AM the same day (See the Fourth Brigade, Army of the Shenandoah). Piedmont Station, Fauquier County, to Manassas Junction, Virginia, 22 July, 1861: The 38th Virginia Infantry arrived by the Manassas Gap Railroad at Camp Pickens, Manassas Junction, Prince William County, Virginia, at 10 AM on 22 July, 1861. Manassas Junction, Prince William County, Virginia, to F Lewis' Farm, a quarter of a mile southwest of Lewis' Ford, on the Bull Run River, 22 July, 1861: The 38th Virginia Infantry was ordered to F Lewis' Farm, a quarter of a mile southwest of Lewis' Ford, on the Bull Run River, at 12 PM on 22 July, 1861. Note: The 38th Virginia Infantry, Company D, and the 9th Alabama Infantry, Companies A and D, were stationed at Sudley Church, Sudley Springs, Prince William County, Virginia, between 23 July and 6 August, 1861 (See the 9th Alabama Infantry). F Lewis' Farm, a quarter of a mile southwest of Lewis' Ford, on the Bull Run River, to Broad Run, two miles northwest of Bristoe Station, on the Orange & Alexandria, Prince William County, Virginia, 8 August, 1861: The 38th Virginia Infantry was ordered to Broad Run, two miles northwest of Bristoe Station, on the Orange & Alexandria, Prince William County, Virginia, on 8 August, 1861, and was stationed at Broad Run, two miles northwest of Bristoe Station, on the Orange & Alexandria, Prince William County, Virginia, between 8 August and 22 September, 1861. Reorganised at Yorktown, York County, Virginia, 29 April & 1 May, 1862: The 38th Virginia Infantry was reorganised at Yorktown, York County, Virginia, on 29 April and 1 May, 1862. Surrendered at Appomattox Courthouse, Appomattox County, Virginia, 9 April, 1865: The 38th Virginia Infantry surrendered at Appomattox Courthouse, Appomattox County, Virginia, on 9 April, 1865. The 38th Virginia Infantry was assigned to the Fifth Brigade, Second Corps, Army of the Potomac, under the command of Senior Colonel J H Forney, 10th Alabama Infantry, on 25 September, 1861.